The recent improvements in the job market have given us reason to hope the economy is finally on the mend. But after five years of struggles, here’s a sobering reminder of how far we still have to go: Nearly two in 10 American men in the prime of their life still are not working. Nearly 83 percent of men ages 25 to 54 – traditionally the core of the nation’s workforce – were working in February, according to the most recent data from the Bureau of Labor Statistics. 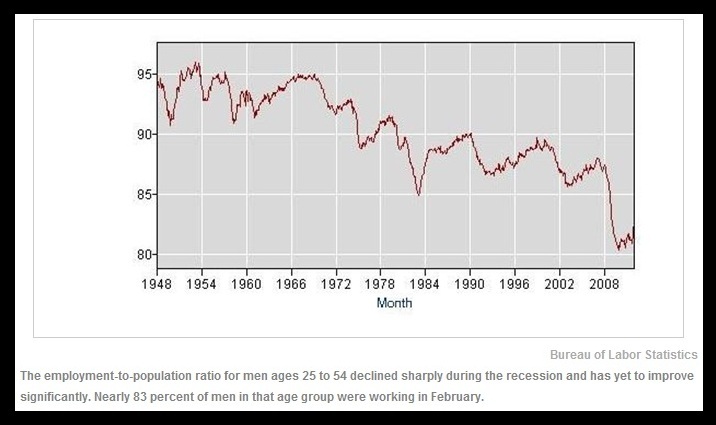 That sounds like a lot, and the employment to population ratio for prime-age men has been improving steadily in recent months. But it’s still significantly lower than five years ago, when about 88 percent of prime-age men were working. Advertise | AdChoicesIt’s also a far cry from the 1940s through the 1970s, where more than 90 percent of men in that age group were usually employed. “This is prime-age men, which is a group that, you know, should be working at very high levels,” noted Harry Holzer, a professor at Georgetown University and an expert in labor market data. Of course, some of those men aren’t working because they are doing other things, such as going to school, or they are disabled or retired. Still, even among men of that age group who are actively seeking work, it’s tough out there. The unemployment rate for 25- to 54-year-old men was 7.1 percent in February, which is an improvement of 3 percentage points from a high of 10.1 percent in the fall of 2009. Still, that’s about double what it was five years ago, before the recession began. There’s also plenty of evidence that even as prime-age men are getting back to work, they aren’t necessarily getting a good job, or one they want. There are currently about 45.9 million 25- to 54-year-old men with a full-time job, according to the Bureau of Labor Statistics data. That’s actually lower than during the height of the recession, which ran from December 2007 to June of 2009. SmartMoney compared that data to the entire population and noted that, by that measure, just 75 percent of prime-age men currently have a full time job. Holzer noted that the data on full-time workers is a less reliable indicator of long-term trends since it isn’t adjusted for seasonal work variations. Still, he said that while some men may choose to work part-time so they can go back to school or take on more childcare duties, it’s clear some men are not able to find enough work. “Relatively few prime age men choose to work part-time,” he said. Holzer said there has been some real progress for working men in recent months, but a look at long-term trends shows that we still have far to go. He’s particularly concerned about working-age men who do not have a higher education and have been hit hard by cuts in fields such as manufacturing and construction.